The complex Musicians pattern is shown here printed in blue underglaze on an earthenware wash bowl. The central pattern consists of four gentlemen drinking and smoking at a table accompanied by two fiddlers on a balcony. Examining the central pattern closely, it would appear that the engraver forgot to include the legs of the three musicians positioned behind the table. Only the table legs are visible. Surrounding this central pattern are vignettes of other musical scenes in a village or rural setting. These patterns include the following: 1) villagers dancing to bagpipes, 2) villagers linking hands around a pole bearing six spheres which may be lanterns, 3) a woman singing while another accompanies on a spinet, 4) a couple standing before a church with spire, 5) a pipe organ, and 6) a string quartet playing from music on a circular table, the latter being the pattern used on the pilgrim flask shown above. 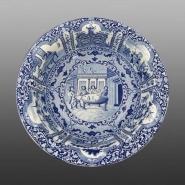 Spode printed these scenes individually on a variety of toilet wares and other useful objects. An earthenware pilgrim shaped flask printed in pink with the Musicians pattern. Seen on this side are four musicians positioned around a table. A floral drapery is placed above them and, above it a cherub holding a violin and bow. The other side of the flask is printed with a pattern consisting of a large organ surmounted by allegorical figures. The design seen on this side of the flask is just one of several used for this pattern The Musicians pattern was used on a wide variety of shapes including items for toilet and personal hygiene. See the wash basin below that displays the various patterns used. This example is unmarked.